Could you imagine a 14 inch notebook computer with a dedicated graphics card weighing only 1.14KG? Imagine no further, as the MSI shows how it is done with their new Prestige PS42 notebook PC! The PS42 is one of MSI’s new notebook computer that was launched at COMPUTEX 2018. It was definitely an attention grabber, as the PS42 distinctly sets itself apart from any other MSI notebooks that were showcased at their booth. Instead of the usual black body with RGB features that’s seen on all the other MSI gaming notebooks, the PS42 has opted for a fresh and classy brushed aluminum body. We were simply impressed by the design and performance of the PS42. It’s a device that targets a specific user market – It’s for those who seeks for a day-to-day compute powerhouse without the added weight. The MSI PS42 comes with the latest 8th Generation Intel Core processors. However, do take note that these are the low powered versions of the Core series. Thus, the best CPU you can get on the machine is only the earlier quad core Intel Core i7, and not the hexa core part. Regardless, consumers still can enjoy the better battery life and increase in compute performance as compared to previous generations processors. Even with its added performance, the notebook still retains its thin and slim design. In fact, the MSI PS42 only weighs 1.19KG and is 15.9mm thin.It seems that the MSI PS42 has redefined what it meant to be a notebook PC within the MSI Prestige lineup. Digging deeper into the specifications of this notebook computer, we realised that the MSI PS42 is also equipped with the Samsung PM961, which is an OEM version of the Samsung 960 Evo. This NVMe based SSD should really give the MSI PS42 really quick read and write speeds, and generally increase its responsiveness. You can even play some simple games or run graphics accelerated applications on the MSI PS42! The PS42 is equipped with NVIDIA’s GeForce MX150 graphics processor with 2GB of dedicated video memory. The MX150 is actually the mobile version of the GeForce GT1030 desktop GPU that is based on the latest Pascal architecture from NVIDIA. Therefore, we can expect pretty decent graphics performance on this notebook. The problem with computers of this slim design is that their high performing processors tend to thermal throttle. To prevent the drop in performance due to thermal issues, MSI has designed and engineered the PS42 with their Cooler Boost 3 cooling technology. This design allows both the GPU and CPU to be properly cooled to ensure that they can operate at their expected speeds all the time. MSI also says no to the “dongle life”, as the PS42 features full-sized ports. On the left, there is a HDMI port, USB 3 Type-C Port and an audio jack. On the right, we spotted 2 x USB 3 Type-A ports, 1 x USB 3 Type-C port and a SD card reader. 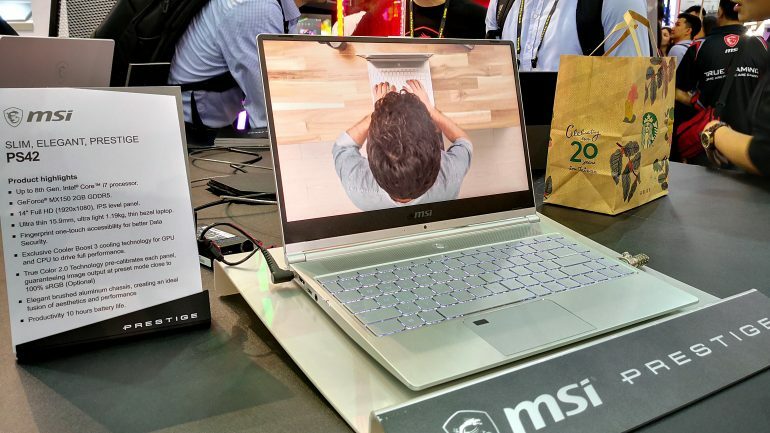 While the product seems to be perfect, there were some compromises that MSI has to take in order for the notebook to retain its thin bezels. The webcam on the PS42 is placed in an odd position, which really captures images and videos at an awkward angle. Well, there are definitely more pros than cons on the PS42. While MSI is not a big name within the mainstream notebook segment in Singapore, we still hope that the this model will be brought here. The design and differentiating factors of this machine should be able to garner some attention and interest in the local market. MSI H370, B360, H310 Motherboard Round-Up – Now available in Singapore!